It's January 9th and places like Wisconsin, Minnesota and Michigan can be seen with golfers hitting the links. Yes, with temperatures soaring to 50 again in many areas in the midwest more and more golf courses are opening up there greens for play. Now wait a second, shouldn't these places have a solid snow depth by now? It's the middle of January! Yes, is an understatement. It was about this time last year that all 50 states (excluding Florida) had snow somewhere in their state! As for the midwest, I think the map speaks for itself. 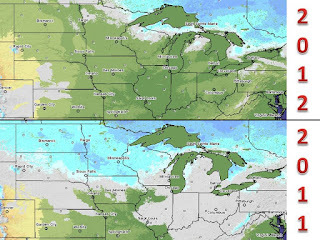 Pretty much nowhere has snow, except for areas where lake effect snows can be seen. There are many reasons why we are in a snowless pattern. I believe the main reason is the indexes of teleconnections like the NAO, AO, and PNA. They have been in the positive range all winter. In contrast they were mostly negative the past record setting winters of 2008 and 2011. Furthermore, we have has a strong polar vortex which leads to a zonal flow (west to east wind pattern) in much of North America. This pattern leads to warm weather because it is very hard for cold air in Siberia and northern Canada to dive south into the continental United States. There are signs of a pattern change in a week or so, but it is hard to say how long it will stick around. If you are a snow lover like me, i feel for ya! We still have two and half months to make up for it..So keep it here to midwest weather talk.